For the 70,000 adults and children worldwide who live with cystic fibrosis, daily life can be a challenge. A touching article by Jeanne Schram on AitkenAge.com, “The hardest part,” according to Hailey Melee, a 10-year-old girl from Aitkin, Minnesota, “is taking my vest along when I visit friends’ homes.” Hailey was diagnosed with cystic fibrosis when she was two years old after she began to show symptoms of the disease. Although in Minnesota newborns are required to be tested for the cystic fibrosis mutation, a positive screen does not mean a child has cystic fibrosis, so not all children who test positive receive treatment. Since the mutation leads to a functional disorder of the exocrine glands, patients have difficulty breathing due to mucus accumulation in the lungs. Some patients choose to use a vibrating vest that loosens mucus to make it easier to cough up. “It’s easier to breathe after mucus comes up,” said Hailey. Hailey visits Children’s Hospital in Minnesota every three months to see if her lung function has reached her goal of 90% or higher. “Hers is 80 percent now,” said her mom, Amy Setzer. When Hailey visits Children’s Hospital, she must be confined to her own room because she is also infected with methicillin-resistant Staphylococcus aureus (MRSA), a bacterium that lives on the body and causes infections. Cystic fibrosis patients are most-often infected with Pseudomonas aeruginosa, but the number of patients infected with MRSA is on the rise. While only 2% of cystic fibrosis patients were infected with MRSA in 2001, 25% were infected in 2010. Often, the infecting exposure to MRSA occurs in the hospital, but community-acquired MRSA is becoming more prevalent. The hospital-associated infections are generally more resistant to antibiotics because those MRSA strains tend to be staphylococcal chromosome cassette mec (SCCmec) types I to III. Community-acquired strains of MRSA are typically of the SCCmec types IV and V. Either is detected through cultures from patients’ lungs. 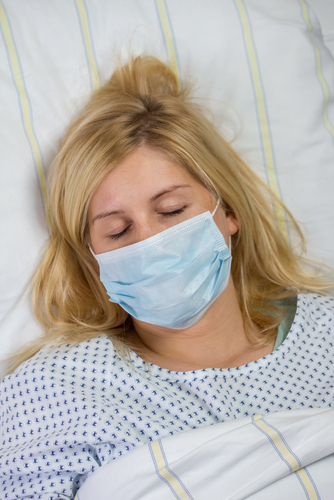 There is no consensus on the best treatment for cystic fibrosis patients infected with MRSA. Some doctors insist that eradication therapy should be used against MRSA, but others argue that its frequent antibiotic use runs the risk of increasing multi-resistant organisms, adding to the burden of disease. For now, patients such as Hailey must continue with their normal hospital visits and be persistent with their cystic fibrosis vest treatments. Many participate in fundraising events across the country and are joined by family and community members. “Some of my sponsors are people I don’t even know,” said Hailey, referring to her team called “Hailey’s Heroes” that completes the Great Strides Walk held at Lake Calhoun in Minneapolis. This year’s event will be May 3rd, and proceeds benefit Cystic Fibrosis Foundation, a foundation that seeks a cure for cystic fibrosis.